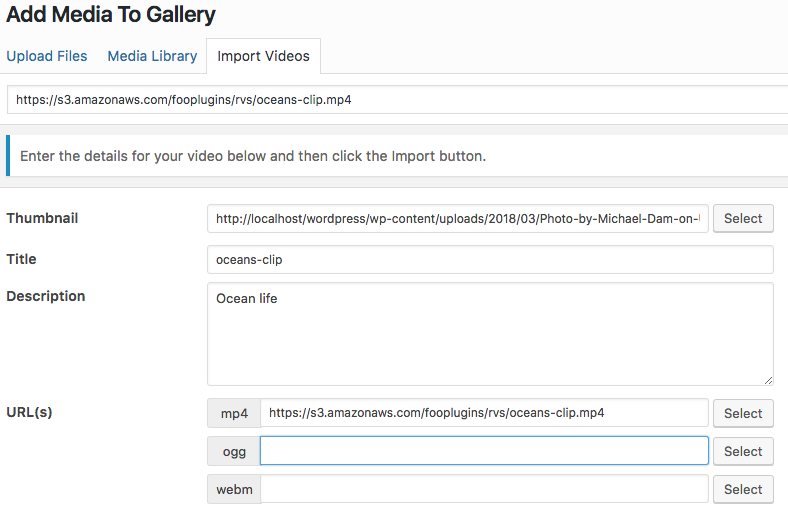 It is possible to add your own videos directly to your WordPress site. However this isn't recommended as videos can take up a significant amount of bandwidth. It is better to use a cloud storage solution. Using object storage is advisable, to help you save your website's bandwidth. One example of this is Amazon S3. Amazon Simple Storage Service (S3) allows you to store any type of data in its native format, all in one place. Once you have uploaded your videos to your storage, you will be able to add the URLs to the Video Importer in FooGallery. This will pull in the videos you want to use in your gallery, without using up additional space on your website. Note: self-hosted video files cannot extract thumbnails, so you need to load an image for this before importing the video. Once your video has been imported, click on the Select button for the Thumbnail field. You can browse your library and select the image you would like. The URL field will populate automatically, or you can paste the URL into the appropriate input. Take note that .mp4 videos offer the best cross browser compatibility. As you enter URLs a compatibility list below this field will update, giving you an idea of which browsers will be able to play your video. Once you have completed this, click on the Import button to add your video to your gallery. 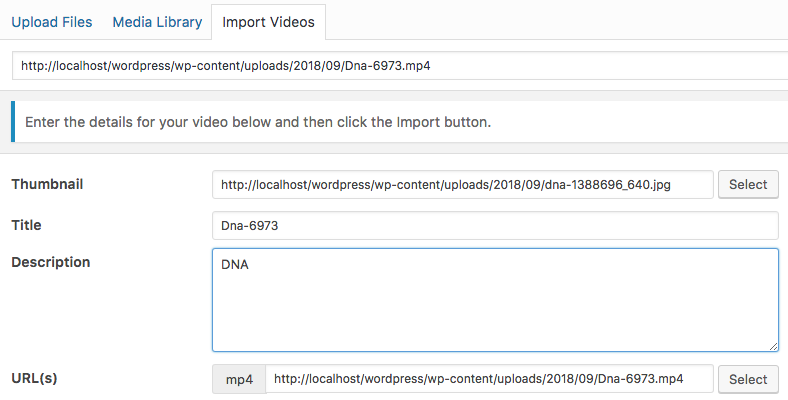 If you decide to upload videos directly to your WordPress site, then you can do so by first uploading the file to your Media Library. This is not always advisable, but if your video file is small and you only have a limited number of videos, then it should not use up an excessive amount of your website space. To add a video directly to your WordPress site, go to the Media Library in your dashboard. Click on Add New. You'll be directed to choose the file/s you want to add. Once you've selected your video file, click on Upload. The video file will open in a window, where you'll be able to adjust the title, caption and other metadata. The top field in this window is the file's URL. You can now Import the video by pasting the video's URL into the Import Video field. Complete the Title and Description field.